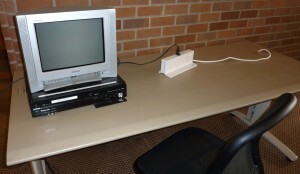 UW-IT and Odegaard Undergraduate Library provide a VHS to DVD converter system to convert VHS tapes to DVD, and vice versa. It is located on the 2nd floor of Odegaard Undergraduate Library next to the Technology Help Desk. An optional remote is also available for checkout at the 2nd floor Information Desk for the operation of the VHS to DVD converter, but it is not required for use of the system. Both the TV and converter have buttons which control the system. Note: Users must provide their own media for conversion. UW-IT and library staff cannot supply VHS tapes or DVDs. This converter is for personal use only, it is not intended for official copyright or UW-owned material. The Libraries Copyright Officer can assist with copyright and UW-owned material. This remote is for use with the VHS to DVD Converter system that is on the 2nd floor of Odegaard Undergraduate Library, but is not required for the use of the system. 2. The screen should prompt you to click the record button (round, red circle) to finalize the disc. After finalizing has completed, the disc should be automatically ejected.